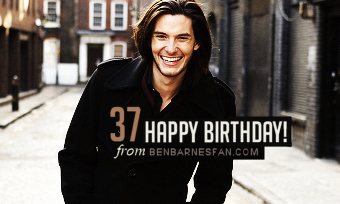 All of us here at Ben Barnes Fan want to wish you a Happy 37th Birthday! Happy Birthday Ben! Hope you enjoy your day. Wish you all the best in your personal life and career. Cheers ?? Happy Birthday Ben. Enjoy your day. Much love. You look younger than 37 ! Happy Birthday My Prince Caspian ! I wish you were My Knight in Shinning Armor !! Happy birthday Ben and to a longer haircut very soon! I love your long hair I miss the Caspian look! Your still Ben B anyway your still handsome! HAPPY 37TH BIRTHDAY, Ben Barnes.